The more you use the Mind Hero app the more your Aura Score will increase. To calculate the score we use the average daily usage of the past three weeks. Zen Moments are also included, so the quality of your relaxation will influence the score as well. 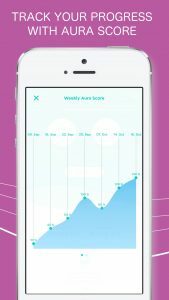 We are recommending the 100% Aura Score goal for users in need to balance a busy lifestyle and schedule. The maximum score of 200% should be aimed for when one needs to deal with severe stress-related issues, is unwell or wishes to reach highly ambitious goals. Please note the app will register usage only when voice or iTunes import tracks are playing. When listening to sounds of nature or instrumentals on their own, usage will not be tracked.